In case you all have not figured this out yet, a lot of what you will read on this blog is complete and utter horsesh*t, Except for my WOD times. No one would post shi*tty time and stats like mine unless it were true. 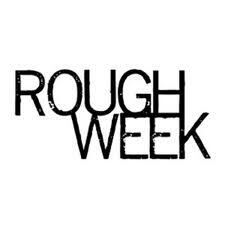 It's been a rough week. We had a long WOD on Wednesday that nearly killed me, Olympic Lifting on Friday, and todays WOD was a Chipper. I'm exhausted and ready for some rest. I made the 35 min time cap (barely) but it came at a price. It left me gimping around for a couple of hours. Running has been hurting my back lately and the 2400m in this one whipped me good. I decided about halfway through the second run that I needed new shoes. I was working out in Mentor that day so I went into Second Sole to see what I could find. This was a rest day but I still took the new Nikes out for a test run on a treadmill. As running shoes go, they get high marks. I logged a couple of miles and felt ok for most of it. I walked for short 1/10th intervals and ran in 1/2 mile intervals. I still didn't feel perfect but I did feel better. The real test will be in a running WOD. We did Olympic Lifting or as it should be called in my case, Special Olympic Lifting. I have come a long way in my lifting but I'm surprised no one makes me wear a helmet. Today we had a chipper.